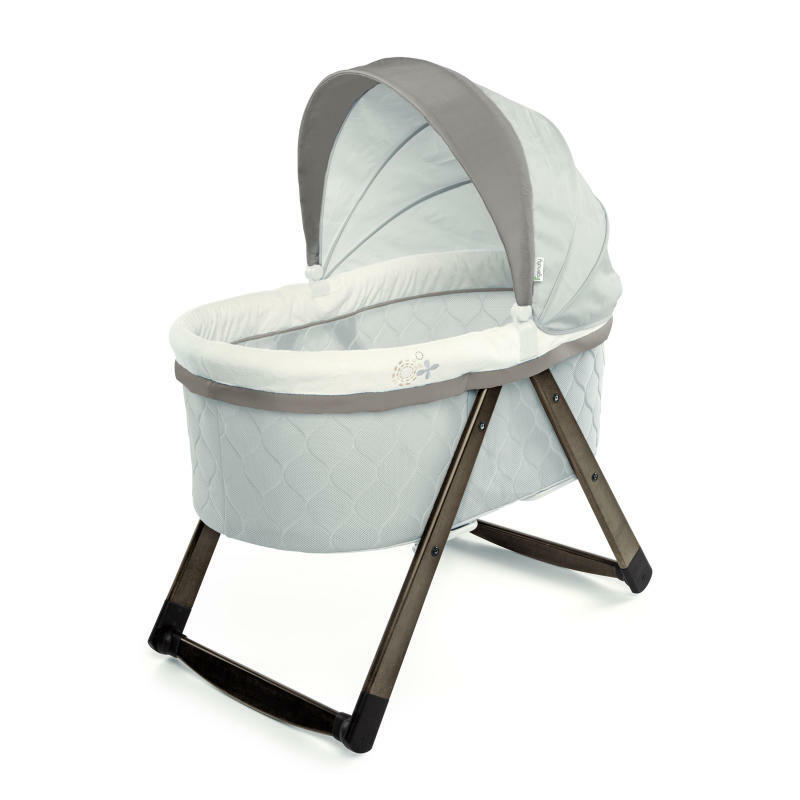 FoldAway Rocking Wood Bassinet - Carrington is rated 4.4 out of 5 by 42. Enjoy more peaceful moments from naptime to nighttime. With Ingenuity's smart design, this sleeping bassinet is a dream for parents and babies. The unique foldable frame collapses and features a handle for easy transport, so you can move the bassinet seamlessly from room to room. For afternoon snoozes, the DreamComfort fabric diffuses light to create a dimmer sleeping environment. This premium fabric is also made to promote airflow giving baby a cooler and comfortable space to rest. When baby is this calm, everyone can rest easy. Mattress size = 21" x 31.5"
Dimension (in) 38" x 21" x 41"
Bassinet fabrics and Mattress: machine wash with cold water. Air dry flat.Canopy: Wipe clean with a damp cloth and mild soap. Do not immerse in water. Rated 2 out of 5 by ironmama from Material reeks of harsh chemicals Cute design (hence the 2 stars). Easy to pop open but watch your finger when pushing the latch to close. My husband and I both got pinched. Looks great until you get close. Even after washing the material, the entire bassinet reeked of a harsh chemical smell. I couldn't put my newborn in something that smelled like that so I returned it the next day. Rated 4 out of 5 by Mellie2015 from Great for traveling! The bassinet is an easy stowaway. The top canopy comes off very easy which is not great when rocking. It is super soft and cozy for your sweet little one. Rated 2 out of 5 by Andy Aus from Wrong hood in box Unfortunately when we opened the box to set up the bassinet for our baby, we were surprised to find the wrong hood had been provided. This is a shame and a frustration as we love the look of this bassinet. We will be returning it. Rated 3 out of 5 by Kander from Sheets Bought this and regular bassinet sheets dont fit. Any recommendations on where I can get them? Rated 3 out of 5 by Michellelee23 from Very pretty bassinet but wish it had more features I did not love this bassinet. While comfortable (has a soft pad), it was large and hard to move around. It would also be great if you could tilt one end up, so the baby could lay at a slight angle. It is very pretty and nicely made. Rated 4 out of 5 by Janet from Beautiful Bassinet! We love the features on this bassinet and the wood detail looks really nice in our home. The fabrics appear to be high quality and I love the rock or stationary options. My only con would be that we have difficulty keeping the canopy all the way up. It still blocks light but won't stay fully up. Overall, I recommend and would buy again! Rated 4 out of 5 by MelM from Well-constructed, attractive, easy to use and move I was pleasantly surprised that the bassinet came out of the box ready to use. I asked my husband to assemble it and to his surprise as well, he only had to attach the shade on top. It's also easy to move and easy to fold and put away. I really like the rocking feature and so does my little one! This is actually our second bassinet and I like having one upstairs and downstairs. It makes life much easier for new parents.